After taking over the kit sponsorship from Bukta during the previous season, Loki continued as kit manufacturer for the 1993/94 season. For the first time since 1977, United reverted back to an all tangerine strip, with tangerine shorts replacing the black shorts that had been used for the past 16 years. The top was embossed with a diamond style pattern, with two black flashes with white trim on each shoulder as the only real detail on the shirt. For the third consecutive season the polo style collar was used, now with a tangerine placket that blended with the top, and a single button. This was the first replica jersey that was sold to the fans with an option of long sleeves. The Club crest had a totally new design for the first time since the 1950s. The standard shield emblem was replaced with a circular badge, with the lion rampant now backed with a tangerine & white diamond motif. The tangerine shorts had large white & black panels, with the new badge also appearing on the bottom right. The tangerine socks also had a large black & white trim. 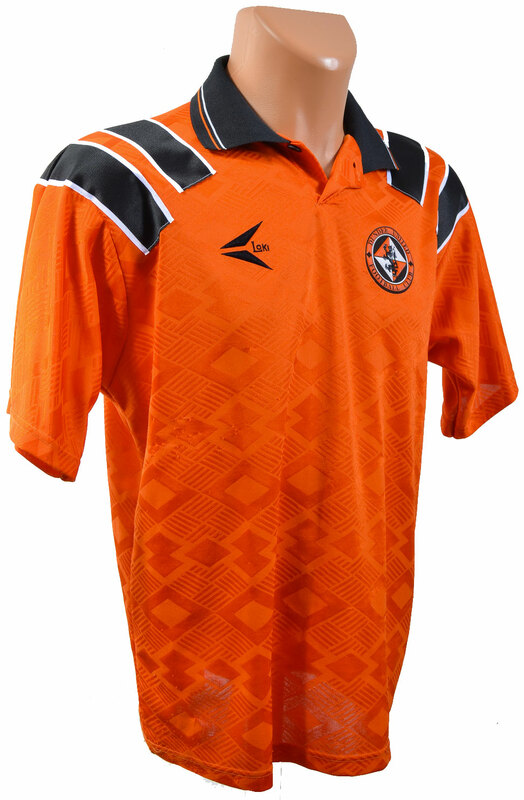 The Home kit made its competitive debut in the 1-1 draw with Aberdeen at Tannadice in the opening game of the 1993/94 season. Ivan Golac had replaced Jim McLean as manager, with one of his first signings being local lad Craig Brewster from Raith Rovers. A memorable highlight in the Premier Division was the astonishing 3-0 victory over Rangers at Ibrox, but a poor League campaign and an exit in the League Cup to Hibs at the Semi-Final stage was soon forgotten about with the teams run to the Scottish Cup Final. For the first time since the mid 1980s, the United shirt was without a sponsor, and this continued for nearly the whole season. Olivetti came in midway through the season to sponsor the Youth team strips, but right at the end of the League campaign car manufacturing giants Rover struck a deal that would see their logo used on the shirts for the 1994 Scottish Cup Final, and would remain on the shirts for two more years.